In an opinion article for USA Today, the president mischaracterized his own record on pre-existing conditions — among other things. 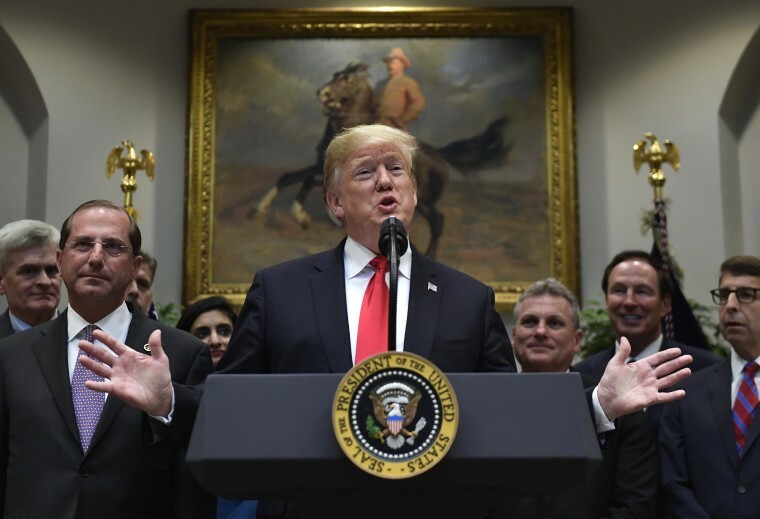 WASHINGTON — With health care a top issue in the midterms, President Donald Trump penned an opinion article defending his administration's actions and critiquing single-payer "Medicare for All" proposals favored by some Democrats that would provide coverage to every American. But the column, published Wednesday in USA Today, included a number of false and misleading claims, both about the Democratic plans and the White House's own policy. Others are accurate, but missing key context. Here's how the president's words measure up with experts, independent analyses, government reports, and his own actions. The claim: "As a candidate, I promised that we would protect coverage for patients with pre-existing conditions and create new health care insurance options that would lower premiums. I have kept that promise, and we are now seeing health insurance premiums coming down." The facts: This is false. The White House is actively trying to scale back current protections for pre-existing conditions in significant ways. In the most drastic move, the Trump administration is backing a Republican-led lawsuit that argues Obamacare's protections for pre-existing conditions are illegal. If successful, insurers would again be allowed to deny coverage for pre-existing conditions. Throughout 2017, the White House sought to pass legislation to partially repeal Obamacare that would affect costs and access for patients with pre-existing conditions. The American Health Care Act, for example, which passed the House last year, would have allowed states to scale back "essential health benefits" that insurers are currently required to cover. The nonpartisan Congressional Budget Office predicted this would make premiums unaffordable for many people with pre-existing conditions. The "new health care insurance options" that the president mentions include short-term health care plans that reduce premiums by denying care for pre-existing conditions. While they could lower costs for healthier patients, they're much less comprehensive and experts say they raise premiums for plans that do cover pre-existing conditions. The facts: While the picture for individual insurance plans is looking better in 2019 than 2018, the claim is misleading. The administration has taken a variety of steps that independent analysts, including the CBO, say have raised premiums on individual insurance plans by a significant amount. While premiums for individual plans are looking more stable in 2019, experts say this is in large part because insurers already spiked their premiums last year. Relevant changes include ending requirements to buy insurance, cutting off cost-sharing payments to insurers that pay for lower deductibles, and expanding the use of less-generous plans that compete with more comprehensive ones. It's likely premiums would be coming down further now absent those decisions. “Having spent a good chunk of the spring and summer reading insurance company rate filings, my sense is that many insurers raised prices last year in anticipation of many of the current changes," Sabrina Corlette, a research professor at the Center on Health Insurance Reforms at Georgetown University, told NBC News. The claim: “[Medicare for All]...would cost an astonishing $32.6 trillion during its first 10 years." The facts: This is accurate, according to an analysis of Sen. Bernie Sanders' Medicare for All bill conducted by the libertarian-leaning Mercatus Center. A separate analysis by the center-left Urban Institute of an earlier Sanders proposal produced a similar figure, albeit with some different assumptions and a different timeframe. Single-payer backers say the $32 trillion number isn’t the full story, though. The new federal spending would replace all existing premiums and deductibles for everyone in the country. The individual gains would vary, though, since the expansion would require a major increase in taxes. There's also a debate over how much the costs would be relative to the current system. The same Mercatus Center story found that total health care spending — private and public — would dip by $2 trillion in one scenario if the bill became law. Supporters of single-payer seized on that figure to bolster their claims that Medicare for All would save money by reducing administrative overhead and reining in costs for drugs, hospital visits, and medical procedures, which are much higher in America than other developed countries. But the authors of the Mercatus Center study say these savings rely on assumptions that they don’t think are likely to hold up. The claim: "Democrats have already harmed seniors by slashing Medicare by more than $800 billion over 10 years to pay for Obamacare." The facts: The $800 billion figure is roughly accurate, according to CBO: The Affordable Care Act reduced spending on Medicare Advantage, a program that allows seniors to access privately-managed plans. The "harmed seniors" aspect is another story. The savings come from reduced payments to medical providers and there's little sign seniors noticed much difference: Enrollment in Medicare Advantage has grown since then and premiums have declined in recent years. The ACA also expanded drug benefits for seniors. Nearly 10 years after the ACA passed, it's hard to tie these changes to Democrats alone. Republicans incorporated the same savings into their own budgets and did not seek to undo them in last year's repeal bills. The Trump administration has since proposed further reductions in Medicare provider payments in their budget. While the president distinguished himself from other Republicans by not pursuing further cuts or a privatization plan, many Republicans in Congress and the administration argue they are necessary to reduce long-term debt. The claim: "[Medicare for All] would end Medicare as we know it and take away benefits that seniors have paid for their entire lives. ... The Democrats' plan means that after a life of hard work and sacrifice, seniors would no longer be able to depend on the benefits they were promised." The facts: Far from scaling back Medicare benefits for seniors, the leading single-payer bills would significantly expand them by eliminating premiums, deductibles and other cost-sharing and adding more benefits, like dental and vision coverage. In his column, Trump argues that these benefits are illusory, because they would cause “massive rationing” and doctors to turn away patients or go out of business entirely. Blumberg took issue with the president's sweeping language. It's unlikely doctors, beyond a limited number who cater to very wealthy clients, would stop accepting Medicare given that the new plan would be the only game in town. Nor is it the case that any expansion in care means less for others. But the president is alluding to some legitimate concerns: Blumberg and other experts say the provider payments in Sanders' single-payer plan are unrealistically low. The government could keep them higher in order to make sure they can attract enough doctors and specialists, but that would also raise cost estimates for their plan. The claim: "Next, the Democrats would eliminate every American’s private and employer-based health plan." The facts: It's true that single-payer legislation would end private employer-based insurance, but it would also replace it with a more generous version of Medicare that covers all Americans. Supporters argue customers would prefer the more comprehensive government plan, while critics say the disruption would be too jarring and the costs would be too high. As the president goes on to mention, however, single-payer Medicare for All is still not a consensus plan in the party. Competing "Medicare for All" proposals by prominent Democrats are less sweeping and would only offer a public insurance option alongside existing private ones. The claim: "The new Democrats are radical socialists who want to model America’s economy after Venezuela." The facts: This misleading claim implies that Venezuela, an economically struggling and oppressive far-left government, is the model for the health care plans under discussion, among other policies. You'd be hard pressed to find a Democrat who cites Venezuela as a model, but plenty cite Medicare itself, which is already an example of socialized medicine. Nor are single-payer or other universal coverage plans unique to radical regimes. Far from it, they're the norm in the developed world, while the United States is considered the outlier. But you don't have to trust the experts alone: Trump himself has repeatedly praised health care plans in places like Australia, Scotland, and Canada in recent years and even backed a single-payer plan himself in 2000 before moving toward more conventional Republican policies. The facts: This is mixing two claims, one about enforcement and one about health care. Both require some more context. A small, but growing, number of Democrats have adopted the activist slogan “Abolish ICE,” which refers not to the border patrol, but the agency created in 2002 to police immigration in the interior of the country. There's still no clear consensus what “Abolish ICE” means in practice, it's some Democrats have pushed back on the idea it's an "end" to enforcement. Often it refers to reorganizing agencies to focus resources on criminal investigations, like human trafficking, instead of less severe immigration violations. Critics on the right say this would nonetheless encourage more illegal immigration. For the most part, Democrats have backed plans that pair a path to citizenship for undocumented immigrants with more immigration enforcement. As recently as 2013, Senate Democrats unanimously backed a bipartisan bill that would address undocumented residents, but also double the size of the border patrol, build more border fencing, and institute new requirements for employers to check the status of workers. The second claim implies that undocumented immigrants would have access to health benefits. This is still undetermined, but not out of the question. The leading single-payer bills in the House and Senate do not specify whether undocumented residents could claim coverage, instead leaving it up to the executive branch.